+ I just discovered virtourist.com, a website with many photos of places we visited including Toledo, Granada, Cordoba, Sevilla and Madrid. You can also “visit” many other places on the globe and learn a lot at virtourist.com which I am now adding to my key websites section (above). + One of the highlights of the trip was seeing many paintings by El Greco who I have often noticed was way ahead of his time. 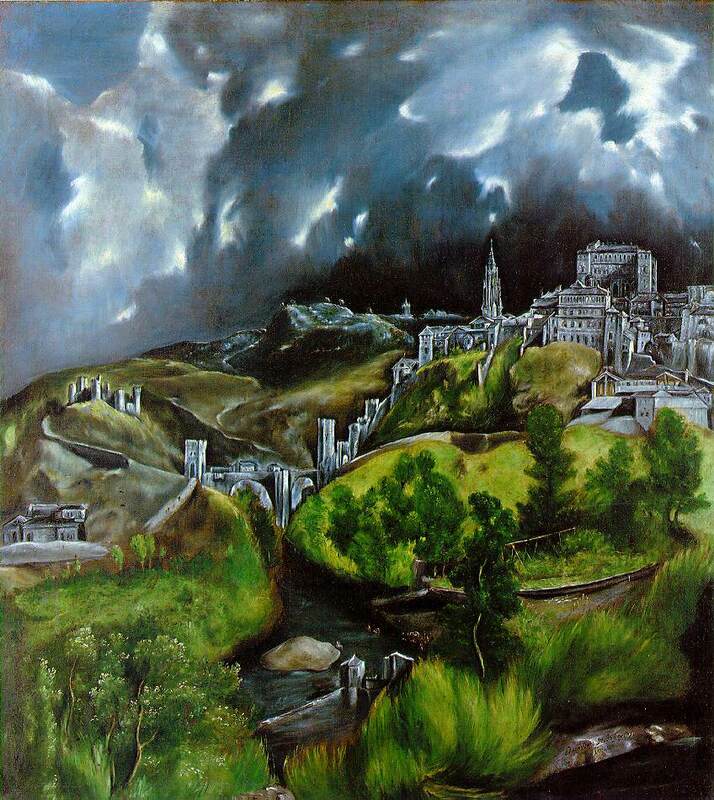 I have just discovered the Web Museum which has photos of several El Greco paintings including A VIEW OF TOLEDO. + I have just uploaded photos from our day in Holy Toledo, June 1. Go to > http://www.pbase.com/abundancetrek/holy_toledo. The interior of “la catedral” is the most amazing sight in Toledo but photographs were not permitted. But the wall and gate and bridges and river and the cityscape are very impressive. + http://members.virtualtourist.com/m/p/m/297d8f/ < In this photo by Cristian Uluru you can see the Grand Fjord Hotel in Geiranger where we stayed on June 12. It’s on the mountainside right by the cascade near the bottom of the Ornevegen (Eagle’s Way). We traveled to and fro on a bus which handled all of those switchbacks with ease! + http://members.virtualtourist.com/m/p/m/297da0/ < Here’s another photo taken by Cristian Uluru. This is one of the gorgeous views of the Geirangerfjord found along the Ornevegen. + Highlights of our trip were many and very memorable but we also encountered a lot of small and not-so-small problems along the way probably magnified because we tried to see so much in a short time. I guess I failed to take the great advice of Rick Steves: Plan the trip with the belief that you will return! So I will mention the problems we encountered as I write about our wonderful trip. Even the problems were part of the fun at times as we solved them! One of the first problems we encountered was trying to get to the hostal in Madrid on our first day in Spain after the grueling flights from JFK to Heathrow and Heathrow to MAD (Madrid’s Barajas International Airport). MAD is so spread out that it took an hour to get to the bus recommended by Rick Steves. The bus ride to a Metro station was fine but then we had to take 2 trains lifting our suitcases up and down many stairways in the hot stations. Then the direct way to the hostal was blocked by the police because of a visit by “the President of Spain” to the area. I didn’t know that there was a President of Spain. They have a King. They have a Prime Minister. Maybe the policeman was trying to help us understand that a very important person (the Prime Minister?) was in the area. We figured out a much better way to get back to MAD with only one Metro ride and not nearly as many stairs. But that one ride was very, very hot! Of course that problem was nothing compared to what was ahead that night: 10 hours in MAD waiting for the flight to Oslo which was delayed 8 hours, from 7pm until 3am. We made new Norwegian friends that night so all was not lost. But I am getting ahead of myself. After we rested up at the very nice hostal we enjoyed our first evening in Spain by lucking into 2 great tapas bars, the first near the Museo Nacional del Prado (close to our hostal) and the second at the Plaza Santa Ana (also close to our hostal). On our second day in Spain, we took a bus to Toledo because the line waiting for tickets on the new AVE high speed train at Madrid’s Atocha station was very long. It took about a half hour to figure out we would never get a ticket for a train leaving any time soon. It took another half hour to get to the bus station by Metro as two trains were required. We didn’t have to wait long for a bus but then the bus broke down and we were delayed for another half hour. We feel we spent enough time in Toledo that day but it was frustrating to be delayed 3 times. That night in Madrid we went to Plaza Mayor and were served a loaf of bread costing almost 3 euros. It was too hard. The waiter wouldn’t admit the bread was bad so we went to the manager and got 1,40 back! We never spent more than one euro for bread anywhere else in Spain. And the bread everywhere else was edible, even tasty. But the main memory of that day is Holy Toledo with its amazing cathedral, El Greco paintings, and its wonderful cliffs and bridges which we saw on the “cheesy” tourist tram which departs every hour on the hour from the Plaza de Zocodover. On our third day in Spain, we left Madrid early in the morning and headed for 4 days and 3 nights in Andalusia. We took the AVE from Madrid to Cordoba. I think its speed is about 120 miles per hour and we were in Cordoba in only 1 hour and 40 minutes. Language problems made it difficult to communicate with the conductor regarding our use of a 3 day Eurailpass in Spain. I filled it out wrong. Then I began to believe I had made a mistake and needed a 4 day pass. Later I remembered that a fourth day was not necessary because the fare between Sevilla & Granada would be cheaper than buying a fourth pass day. When we arrived in Cordoba, we had to leave our luggage at the bus station across the street from the train station because there were no lockers left at the new train station. Fortunately, I knew the bus station was across the street because of Rick’s book! Several lockers were still available there. Then, we followed Rick’s advice and took a bus from the train station to the city center. That was easy. But later we couldn’t figure out how to get a bus back to the train station and had to resort to a taxi. We took a slower (cheaper) train from Cordoba to Sevilla. We didn’t think we would make it because we got conflicting information from railroad officials. The room at the Sevilla hotel was too hot and we had to change rooms. That room was also too hot but we went out to restaurant and it was OK when we returned. We did get to the hotel in time for a swim in the pool and that was quite refreshing. Cordoba was well worth the stop because of its amazing mosque, the Mezquita. The little travel problems we encountered that day did not keep us from continuing to enjoy tasting some of the rich cultural and spiritual heritage of Spain. Soon I will write about Sevilla & Granada & Madrid. and read my positive reaction to the 3 hotels we stayed at in Andalusia, particularly the Hotel Saray in Granada. + Jet lag days have begun. What a fantastic trip it was even with glitches galore! There were so many peaks and a few valleys. Getting stuck 10 hours (until 3 in the morning) at MAD (Madrid's airport) because of the failure of Norwegian Airlines was the deepest valley. Some illness for both of us at times was also a valley. Other glitches were numerous but never serious enough to interfere with the great experiences we had day after day after day. Using the Rick Steves book on Spain helped us have a lot of fun in Madrid, Toledo, Sevilla and Granada. Of course, it didn't hurt that Mary's Spanish is pretty good. I will offer a more comprehensive report soon. + Dinner on deck with my recently rediscovered second cousin and his family was great last night. The view of Trondheimfjord from their deck is spectacular. Sun sets at about 11pm in NNW and rises about 3am in NNE. We ate a delicious dinner on the deck with the sun shining and keeping us warm. I walked around town in the continuing daylight at midnight. Lots of partying. I took many photos. Tomorrow we head for Molde & Geirangerfjord on train and bus and ferry. + This is just a brief sumnmary of our trip so far from an internet cafe near Plaza Callao in Madrid. We are on schedule except that we eliminated today´s plan to go to Avila and Segovia. We have enjoyed train rides and bus rides and even taxi rides. One taxi ride in Granada was longer than expected because we didn´t pronounce the name of our hotel correctly! But the views we saw were great. La Hambra is fascinating. Sevilla is just as Rick Steves said it is -- meantr for passeo (strolling around). Madrid is a fascinating capital city and bustling metropolis quickly catching up economically with the rest of Western Europe. People are friendly but reserved. I could spend weeks here in Spain. It is a fascinating country blending Arab and Christian and Roma & Jew & Celtic and others. It is really hot now in Madrid but it was chilly when we spent our first couple of days in Madrid & Toledo last week. The cathedral in (holy) Toledo is amazing as is La Hambra and other old holy buildings and alcazars and palaces. The Mestizzo in Cordoba is just as fascinating as La Hambra in Granada. I am glad Christian Spain preserved these Islamic masterpieces. I am realizing that the Christian mind (and especially the western Christian mind is so different than the Islamic mind. The Islamic emphasis on the transcendence of God is matched by the Christian emphasis on the immanence of God. This is seen in so much art, particularly El Greco my favorite Spanish artist by far. Toldedo was his home and displays his art in many places. + I just found out we can stay at Andalsnes, the end of the train line from Dombas, and rent a car there which would be our means of reaching Geiranger the next day. So I may change our plan which currently is to take an evening bus to Molde, stay there, and rent a car the next day in order to get us to Geiranger. + Yesterday I printed up all of our hotel and hostal confirmation letters and our airline and train and car rental and Alhambra confirmation letters. Quite a pile! + I finally uploaded photos from our trip to Switzerland in 2004. Visit > http://www.pbase.com/abundancetrek/swizerland_2004. Visit my 2004 travelblog. + I have now booked a hotel or hostal for every night of the trip. + I found some Toledo info on the web > http://www.spain.info/TourSpain/Destinos/TipoII/Datos%20Generales/G/TP/0/Toledo.htm?Language=en. Of course, the Rick Steves book has a lot, too. 1. We must make the plane in Oslo on June ##. Is it necessary to make a reservation for Andalsnes to Oslo before we leave USA? No, we don't think that's all that necessary to make any reservations at all, but if you wanted to, it would be quite cheap and easy to do so in a Norwegian station. We would definitely not make them before leaving the U.S.
2 - Is it necessary or useful to reserve the following trains before we leave USA? Madrid-Sevilla –yes | Sevilla-Granada – no | Granada-Sevilla – no Sevilla-Madrid –yes | Oslo-Lillehamer –no | Lillehamer-Trondheim –no | Trondheim-Andalsnes – no | If you'll be in Europe at least a few days before you take the Madrid-Sevilla trip, we'd recommend making those reservations in the station as soon as you arrive in Europe. If you think you won't have enough time, and you are eager to avoid the risk of having to take a slower train, you can call Rail Europe for a reservation: 800 438 7245. 3. Is there a bus from Andalsnes to Geiranger? Yes -- we've taken it. For travel beyond areas covered by Rick Steves books, we recommend Lonely Planet and Rough Guide books. You can also ask locally about the times for that bus. You could also try contacting the tourist office directly at www.visitandalsnes.com. When we took that bus, we left Andalsnes early in the morning, took a boat in the Geirangerfjord at midday, and spent the afternoon on the bus to Bergen. It wasn't enough time -- give yourself some time to soak up that fjord; it's spectacular. / Here's what Lonely Planet Norway says about the bus from Andalsnes to Geiranger: Buses along the "Golden Route" to Geiranger (Nkr 146, three hours), via Trollstigen, the Linge-Eidsal ferry and the scenic Ornevegen, operate between mid-June and August. The Trollstigen pass is cleared and opens by at least 1 June, and early in the season it's an impressive trip through a popular cross-country ski field, between high walls of snow. Buses leave Andalsnes at 8:30am and 5:30pm daily, and from Geiranger at 1pm and 6.10pm. + We have reserved hotel or hostal rooms now for 2 nights in Madrid, 1 night in Granada, 2 nights in Oslo and 2 nights in Trondheim -- about half of our trip. I have been using sidestep.com & venere.com & otal.com & RICK STEVE’S SPAIN 2006. If I can book a room near the Oslo Airport on the nights we will be traveling into and out of Norway, I will cancel the Oslo reservations in favor of Gardermoen where the Oslo Airport is located. I discovered that Gardermoen is on the train route from Oslo to Lillehamer and, so, staying there will save us some time. + I’m still trying to figure out how to get around in the Romdal region. I found http://www.andalsnes.net/ and sent an email to the tourist bureau there requesting info. + I just discovered a map of Romsdal including a street map of Andalsnes. + I just discovered a website with information on the Golden Route which includes Geiranger & the Trollsteigen. + VirtualTourist has some great ideas for traveling in the Andalsnes area. + I just discovered a website with lots of information about the Romsdal area including Møre og Romsdal - Kristiansund - Molde & Romsdal - Geiranger - Ålesund & Sunnmøre which is clearly one of the most beautiful places on the planet and we only have 48 hours or less to see it. We will be taking the train to Andalsnes and then a bus to Molde where we can rent a car and then drive the wild hairpin turns of the Trollstigen on the way to Geiranger. Maybe we will stay one night at the Grandefjord Hotel in Geiranger with a view of the fjord. + I got serious about our travel plans and went to the RailEurope website and booked 4 Eurailpasses, 2 for Norway and 2 for Spain for a total cost of $826. Each pass is for 3 days second class and saves us at least 200 dollars over the cost of regular tickets for those 6 days if we stick to our current plan. We will still need to buy some tickets for 3 additional days in Spain for shorter trips where the tickets will cost less than extra pass days would cost. + I am looking forward to meeting my cousin in Trondheim who is a railroad enthusiast. He has invited me to visit some great train sites around Trondheim. Here is an excerpt from a recent email > “A possibility for perhaps Saturday June 10th, might be to take you on a trip (by car) to do some train spotting or something like that. We have to interesting 1 meter gauge (narrow) railroads/tramways in the region. + I am thinking about renting a car for 1 day in Molde, Norway so we can go up on the Trollstigen and see Geirangerfjord and possibly visit Alesund as well. I found a useful website for mapping routes > http://www.drive-alive.co.uk/. I found a photo of the Trollstigen which leads to even more photos of this very scenic region. I found a recommended route with more photos. Then I found Trollstigen.net. I found a great car rental price at > http://www.a1tourism.com. FRIDAY, MARCH 31, 2006 + sunny and getting even warmer. It’s Spring in the great Northeast! + In Trondheim, during the nursing conference Mary is attending, we will be at the Britannia Hotel. + A major tourist attraction in Spain is Granada’s Alhambra. There is a website which sells tickets with reservations. + We are beginning to think seriously about our sleeping accommodations for our 7 nights in Spain today. THURSDAY, MARCH 30, 2006 + sunny and getting even warmer. It’s Spring in the great Northeast! + Making progress on booking. We are headed to Oslo from Madrid on June7. I am beginning to find good deals on train and car rentals in both Spain & Norway. We probably won’t go on the Hurtigruten. We probably will spend at least one night in Romedal, one of the most spectacular regions of a spectacular country. Somebody said that if Norway was placed somewhere in our 48 contiguous states, the whole country would be declared a national park! WEDNESDAY, MARCH 29, 2006 + sunny and getting even warmer. It’s Spring in the great Northeast! + Molde, a coastal resort town between Kristiansund & Andalsnes is a potential overnight sight. Here’s a hotel list. + It has been time consuming and frustrating to figure out bus and ferry and boat schedules and fares in Romdal. I just discovered Fjord1 which helps a lot. + Last night I discovered that the Virtual Oslo website has quite a few 360 degree pan photos of Norwegian cities and towns with orienting maps. Lots of good slide shows too. + I went to Barnes & Noble and bought RICK STEVE’S SPAIN 2006 & an EYEWITNESS TRAVEL GUIDE for NORWAY. + I am thinking about the Norway coastal cruise called the Hurtigruten. We could go from Trondheim to Kristiansund and then take the bus & train to Oslo the next day. The ticket price is reasonable but I can’t believe the boat’s restaurant meal prices! I assume there is a more economical snack bar aboard. + My family is helping me locate a Trondheim relative, a second cousin of my generation on my maternal grandfather’s side of the family. I found an email address for him and am eagerly awaiting a response. My nephew visited him and his family in 1992 and remembers having a wonderful time. Norwegian Air Shuttle > http://www.norwegian.no/sw7127.asp < The ticket prices are extremely low between Madrid & Oslo and Oslo & Trondheim and on many other routes. The flight between Madrid & Oslo would get us in quite late but there is a nearby hotel with reasonable rates. + I asked relatives who have been to Norway and/or have contacts for help and the help has begun to arrive! Here are links for a recommended bus trip Andalsnes-Molde > http://www.177mr.no/ruter/Molde-Åndalsnes%2008.01.06%20Web.pdf. & http://www.177mr.no/142-143dagogNattekspressen05-06PMD.pdf & http://www.177mr.no < I wish I knew Norwegian but I think I can read the timetable anyway.